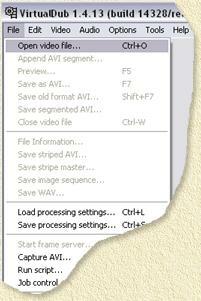 On this page I'll quickly explain how to cut AVI files, for example DivX movies. Main purpose for cutting a movie is to either make it fit on a CD (removing the credits or removing the intro) or to split a movie into two files for copying them on two CD's. 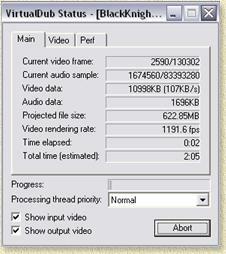 For cutting a movie we will use VirtualDub. You can download the most recent version at the VirtualDub website. The current version of VirtualDub is pretty easy to install: Unzip the archive (ZIP file) using WinRar or WinZip to a folder. Usually, I copy this entire folder to C:\Program Files and make a shortcut to VIRTUALDUB.EXE (there is a special Pentium 4 version, this one needs to be downloaded and added to the content of the VirtualDub folder, the filename of the Pentium 4 version is VEEDUBP4.EXE!). After installing VirtualDub, you can start the application. This first example shows you how to cut away the end credits of a movie. First open the AVI file using the menu "File" - "Open video file..." (or press CTRL+O). A file dialog will appear. Using this dialog, browse to the AVI file you want to make shorter, select it and open it. The basic approach here is to select the part that we want to have. This means that the part we select will become the content of our new AVI file. If you want to cut only the credits, then the first frame of the AVI will remain the first frame. Click the "Mark In" button ( ). This will mark the beginning of this AVI file as the beginning of the selected part of the AVI file. The next step will be determination of the end point within the AVI, which we mark with the "Mark Out" button ( ). You can use the slider to determine the proper position. I usually move the slider way to the right and slowly move it to the left up until the point where I start seeing the movie instead of credits. Then I start moving the slider to right again, using the "Key next" button ( ), which jumps to the next key-frame each time you click it. Alternatively you could use the "Scene Forward" button ( ) to let the movie play where you click the "Stop" button ( ) once you found the proper position. Once we found the end position, we can click the "Mark Out" button ( ). You will notice on the slider bar that a gray bar will appear between the mark-in and mark-out points. This indicates that this is the piece that we want to keep. Now we need to do some settings on how VirtualDub should copy this. Since we only want to remove the end of this move and do not intend to change compression or anything else, we need to tell VirtualDub to do so. First choose from the "Video" menu, the option "Direct Stream Copy". We do the same for the "Audio" menu, also select "Direct Stream Copy". Once that is completed, you're done. It's not a bad idea to test the result afterwards. This is commonly used when an AVI file needs two (or more) CD's space wise. Basically we repeat the first example, the only difference is that for the first cut, our ending position will be (when cutting it into two parts) the middle of the movie. The rest will remains the same; set "Audio" and "Video" to "Direct Stream Copy" and use "File" - "Save as AVI" to save the first part. After VirtualDub completed this, we must select the second part. This is done pretty simple, as the slider is still positioned at the end of the previously marked scene. Simple click the "Mark In" button ( ) - and the end of the previous scene is now marked as the beginning of the next cut. Tip: Consider moving the slider a little bit to the left, so there will be a little overlap when switching CD's. Don't forget to press the "Mark In" button ( ) once more. Now move the slider to the end of the move and press the "Mark Out" button ( ) and repeat the steps: set "Audio" and "Video" to "Direct Stream Copy" and use "File" - "Save as AVI" to save the second part.